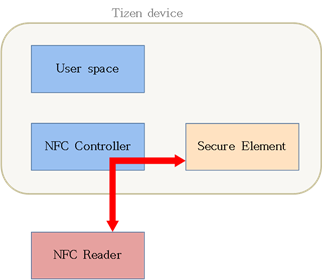 Tizen enables you to use Near Field Communication (NFC) functionalities, such as reading and writing tags, and emulating a smartcard. NFC is an international standard (ISO/IEC 18092) that specifies an interface and a protocol for simple wireless interconnection of closely coupled devices. For more information, see the NFC Forum. You can activate or deactivate NFC, monitor NFC events, and retrieve adapters for various NFC modes. You can create NDEF records and messages. You can manage tag events and read and write NDEF messages from and to an NFC tag. You can manage peer-to-peer (P2P) events and send and receive NDEF messages between peer devices. The card emulation mode allows an NFC device to function as a smart card. You can enable and disable the card emulation mode, register an AID value, manage secure element events, manage HCE events from the NFC reader, and send HCE responses to the NFC reader. In traditional card emulation, the NFC controller in the device routes data from the NFC reader directly to the secure element (SE), and an applet handles all of the data in the SE. The user does not participate in the operation at all. Tizen supports eSE and UICC as SEs. The application has an "AID" value, which is stored in the NFC routing table (blue arrow in the following figure). 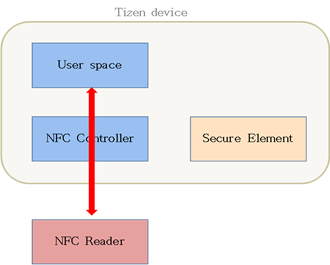 Before any NFC operations, retrieve the appropriate connection adapter with the corresponding GetXXXAdapter() method of the Tizen.Network.Nfc.NfcManager class. To create an NDEF record, create a new instance of the Tizen.Network.Nfc.NfcNdefRecord class and give it the required values. In the following example, a record is created with 3 bytes of binary data as a payload. You can also create NDEF records to store different kinds of data, such as text or images, by using different parameters when creating the Tizen.Network.Nfc.NfcNdefRecord instance. When it is no longer needed, deregister the event handler. You can both send and receive NDEF devices between peer devices in P2P mode. Create a new NDEF message as an instance of the Tizen.Network.Nfc.NfcNdefMessage class and a new NDEF record as an instance of the Tizen.Network.Nfc.NfcNdefRecord class. 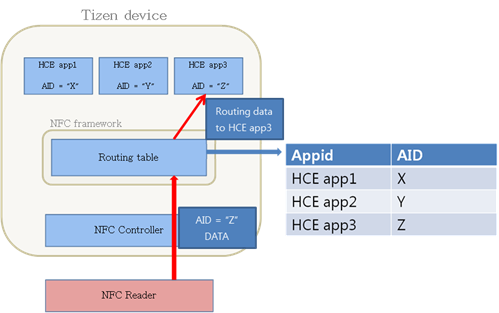 Then append the record into the message with the AppendRecord() method of the Tizen.Network.Nfc.NfcNdefMessage class.